Join us in 2019 at our Orlando, Fort Worth and Chicago shows. 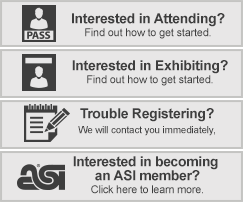 Why Attend the ASI Show? A manageable show floor to do business… seriously. New products – you’re going to see them! Click here to submit your question and we’ll reply back ASAP. Discover Orlando, Fort Worth and Chicago for yourself. Register online today or call our Registration Specialists at 800-546-3300.